In the quest for an answer to childhood obesity, scientists have explored family eating habits, and have found that the answer may lie not on our plates, but on where and how we are eating off those plates. A new study from the October issue of Obesity has shown that kids from families that dine together with no TV on, and who stay in their seats until everyone has finished eating have a lower weight and a lower BMI (a measure of body fat based on weight and height). The researchers suggest that where children are eating and how long they’re eating for may be the largest driver of obesity. However, the scientists also clearly state that just because a link between weight, BMI and eating habits has been found we cannot make the assumption that they are directly caused by one other. From our perspective, this study is enlightening in that it showcases how family dynamics may influence children’s weight—and it takes a strong departure from the typical “food-centric” approaches that most nutrition studies tend to focus on where childhood obesity is involved. 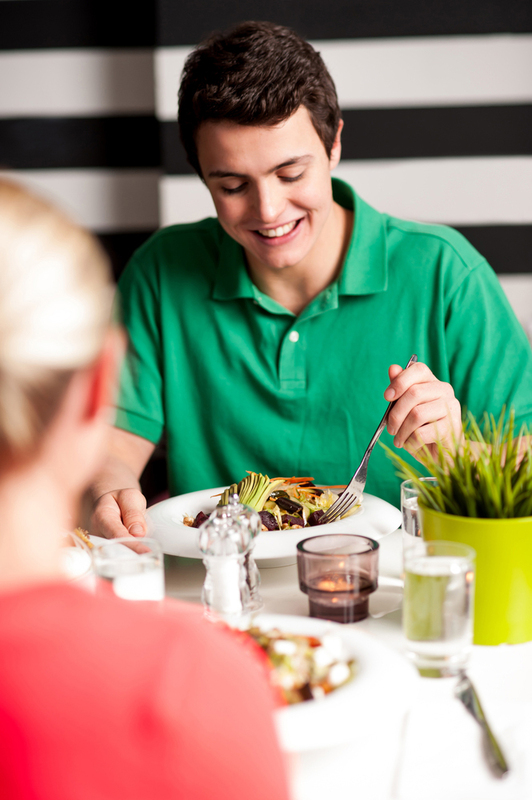 However, we must be careful in not attributing these favourable dining habits to a healthy weight in children. Families that are able to dine and sit together may also have access to different quality and quantity of food, for example, or the parents may have more time to spend with their children in general, or have less stress than families who do not dine together. Too early to draw definitive conclusions from this study, but a novel and interesting area of research and we are intrigued to learn more. This site has great additional information on children’s weight for parents, kids and teens.